Almost 100 hand thrown plates decorated by staff and students at Gray’s School of Art will go on display tomorrow (Tues, Nov 25), to help raise funds for a cause close to the heart of one lecturer. The annual exhibition of work is organised by 3D Design lecturer Simon Ward, who was first inspired to do something in memory of his mother after she passed away at St. Barnabas House Hospice in Sussex. The plates, which were designed by a wide cross section of staff and students, are available to purchase, with 25% of the proceeds going towards supporting the work of the hospice in providing specialist palliative care to patients with terminal illnesses. The rest of the money raised will go towards supporting final year students exhibiting at the New Designers event in London next year. This year’s exhibition will also feature a range of plates designed by members of Kirkcaldy Art Club, as part of an outreach workshop run by Simon. He said: “I see the plates as little potholes of creativity where each individual has created a personal design that resonates their own studio project work or self-directed interests. 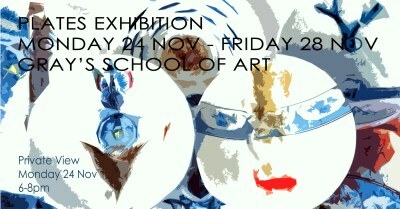 The exhibition, which will be held in the foyer at Gray’s School of Art, will run until Friday November 28th.